When we perform septic tank design and installation in Tampa, FL, we will make sure that you feel informed throughout every step of the process. 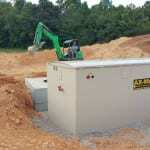 When you consider the options for residential septic tank design, talk to our experts at Southern Water & Soil. We have engineers who can design a septic tank that works with what you need, whether you have a large property that needs drip irrigation options or if you just need a septic tank that can accommodate a single home. Most people hire experts to install the septic system, since the process involves specific steps to ensure that waste is treated and disposed of appropriately. In addition to having on-staff engineers, we also have licensed septic tank contractors who can make sure that your project is approved and meets local requirements before we begin installation. We will talk to you before we start, making sure that every aspect of the system you want is installed and is part of the job. We offer alternative septic tank design, as well as top brands of systems such as Geoflow, Hoot, Orenco, Norweco, No-Mound Systems, and more. When we begin the septic tank design process, we will use our knowledge and expertise to choose a system that will achieve the results you want for your commercial or residential property. When we perform septic tank design and installation, we will make sure that you feel informed throughout every step of the process. This ensures that you aren’t surprised by unexpected problems or additional costs. Our service area includes Tampa, Florida, as well as surrounding cities. We offer a variety of septic services, including pumping and cleaning, repair, routine maintenance, and more. At Southern Water and Soil, we offer septic tank design services in Tampa, Odessa, Lutz, Land O’ Lakes, Brandon, Orlando, Plant City, Dade City, Bartow, Lake Wales, and Lakeland, Florida.